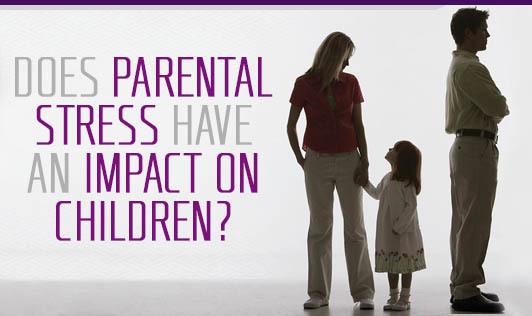 Does Parental Stress Have An Impact On Children? Stress can have a detrimental effect on children just as it does on adults. Parents tend to underestimate just how much stress their children experience and the impact their own stress has on their children (APA). Studies have shown that children as young as 8 years old are reporting that they experience emotional and physical health consequences often related with stress. The author, David Code, in his book, "Kids Pick Up on Everything", has compiled evidence from a handful of labs around the world, which have suggested that a parent's level of chronic stress can seriously impact a child's development. It can also affect the developing brain all the way to the genes of your child during pregnancy. A new study by APA suggests that 90% of kids know when their parents are stressed either because they have seen them arguing or they don't spend time with them. As a result, many kids reported they felt worried, sad and frustrated. One third of them complained of stress related headaches and stomach aches as well. How can parents address the effects of their stress on their children? (American Psychological Association) Here's the answer to that question. Watch yourself: As a parent, you need to keep a check on how you react when you feel anxious as your kids get these negative vibes from you which puts pressure on them. Anxiety is contagious and you might be setting long-term behavioural patterns in motion that could harm their health, also putting them at a higher risk of diabetes, depression and heart disease. Acknowledge it: Don't underestimate how your tension influences kids. Sue Schellenbarger, a columnist of the Wall Street Journal's Work and Family says that children know when parents are stressed even during times when they think they are doing a good job of protecting them from it. Teach your kids: Kids model what you do, hence it's important that as a parent, you should manage stress in healthy ways such as exercising and listening to music to calm your nerves. Play: Play is particularly important for stressed out parents, who should find a way to have fun whenever they have a chance. Make time to explore an activity that you and your kids both really love- other than a sedentary one such as watching TV and playing video games that definitely don't count. Your kids and your nervous system will thank you! "It is critical that parents communicate with their children about how to identify stress triggers and manage stress in healthy ways while they're young and still developing behavioural patterns. If children don't learn these early on, it could have a significant impact on their physical and emotional well being down the road, especially when they become adults! (Dr.Katherine.Nodal, APA's Executive Director for Professional Practice)"